Why buy your bamboo from us? 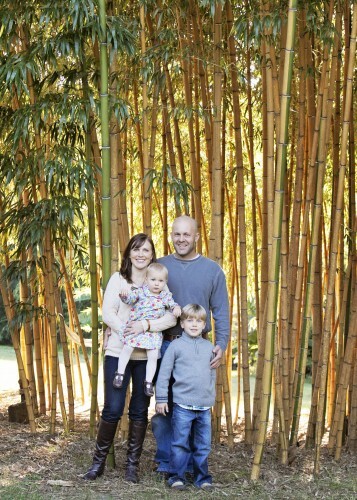 Well, to start with, we are a family-owned and operated farm and nursery specializing in bamboo. We grow over 100 varieties of bamboo, both non-invasive and grove-forming species. When you buy your bamboo from us, you are not only buying the plant. We will take the time to listen to your needs and help you decide which bamboo makes the most sense for you. If you already know what you need, that’s great. However, if (like most people) you need a little help deciding, we are happy to be of service! If you buy your bamboo from one of the big box stores or another nursery that “just happens to have a few bamboo plants”, you never know what you’re getting. Try asking any of their employees for information on a particular bamboo and see what happens. We’ve heard nightmare stories of people who thought they were buying a “clumping” bamboo and ended up with a running bamboo. And we’ve seen numerous mis-identified or regionally-inappropriate bamboos for sale at the big box stores. We take great care to make sure all of our bamboos are correctly identified and we are familiar with each one’s growth habit and cultural requirements. Whether you are a wholesale or a retail customer, we will consider your individual needs and recommend the best bamboo varieties for you! Visits to the farm (by appointment) are welcomed and encouraged to give customers an idea of the many different bamboos available. Please look around our site and feel free to contact us with any bamboo questions! Non-invasive (clumping) bamboos make the fastest growing and most attractive privacy screens, windbreaks, and noise/dust barriers for USDA plant hardiness zones 8 and higher. A few of the “clumpers” even perform well in colder climates. In addition to these more practical uses, many varieties are very ornamental and make fine tropical specimens or focal points in mixed plantings. Clumping bamboos come in many different shapes and sizes. 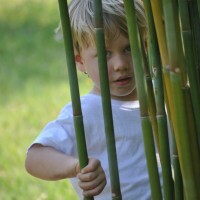 From short and wide to tall and narrow, there is a clumping bamboo to fit almost any planting site. Clumping bamboos also complement many common ornamentals including Japanese maples, azaleas, palms, bananas, gingers, and elephant ears, among others. Grove-forming (running) bamboosmay be used similarly, although containment and available space are issues that should be considered prior to planting. Running bamboos are generally more cold-hardy than the clumping bamboos that we grow and thus better suited for areas outside of the Deep South. trategy for a more sustainable agriculture. We are active members of the Southeast Chapter (SEC) of the American Bamboo Society (ABS). Tracy currently serves as President of the SEC and also served as Vice-President in 2007. Katie is past editor of the SEC’s quarterly newsletter and is also the membership chair for the chapter. Our work with the SEC/ABS involves working closely with other bamboo growers on a regular basis. In addition to the bamboos we offer, we can locate other bamboos if needed. Let us know if you are having trouble finding a particular bamboo and we’ll do our best to find it for you! Consultation on species choice and siting is provided as a service to our customers. We are also available for consultation on maintaining or removing existing bamboo plantings. This can often be done via telephone/email at no charge. For situations that require a site visit, fees are based on travel mileage and time required at the site. Please contact us for more information. There are many factors to consider when choosing a bamboo for a particular site or end-use. All bamboos are not the same! We are familiar with the different growth habits, cold hardiness, and potential uses of the bamboos that we grow and are happy to work with clients to pick the ones that best suit their needs.